Can the same painting give us difficulty and joie de vivre? If you have ever encountered a painting by Shirley Jaffe, you know the answer to this question. If you haven't, then you may be skeptical that such a thing is possible. You will have also, alas, missed some recent opportunities to see paintings by Jaffe in New York. Tibor de Nagy presented a group of new paintings at the Park Avenue Armory Art Show in March, and also a gathering of paintings from 1969 to 2009 at the gallery's Fifth Avenue space. It was during that show that I met with Jaffe at the gallery for the following interview. I've known Shirley since I was a teenager, and written frequently about her work, but this was the first time we had ever sat down to do an interview. I was a bit concerned about the (for us) unaccustomed formality of an interview, and also about Shirley's well-known propensity to disagree with anything that anyone says about her work. She did, as expected, reject some of my observations but, thankfully, not all of them. I started off by asking her about some Parisian art world history (Shirley has lived in Paris since 1949), but what I really wanted was to ask her about her paintings, how she arrives at her unique brand of complexity, how her work has been evolving for the past 60-odd years, and how it continues to evolve. Jaffe: No, Barré was part of another group and, to my knowledge, Fournier had absolutely no interest in his work. Martin Barré was like a secretive French artist who belonged to another clan. It's only now that we can see that there's a kind of relationship to some of the artists that Fournier showed. At the time he was absolutely outside of it. Rail: As you moved from gesture to geometry, touch became less prominent, and that's true of the French painters as well. In their different ways, Hantaï and Viallat were also trying to make paintings without that touch of the hand. Jaffe: For me, it was quite different because I built up the painting by the gesture in the first period. But then I asked myself: What essentially did I want to say? What was I painting? I thought I had to start like a child, try to reduce everything, gesture and also significance. In the very first paintings it wasn't geometry, more like "lite" geometry. The lines weren't always straight. I kept elements of a kind of gesture in a certain section of the painting. And then, I began to develop on that. I had no clear program, mind you. Rail: You've said that one of the things you got inspiration from in Berlin was contemporary music, composers like Xenakis and Stockhausen. Rail: There was this break in your work in Berlin, but there are not that many breaks in your career, where one can point to a before and after. A lot of artists work in phases or periods. You can look at paintings made for a particular show and see that they form a recognizable body of work. With your paintings, apart from the break in the 1960s, and maybe another circa 1980, it's very hard to sort them into separate bodies of work. I'm reminded of Morandi, an artist who is always evolving but very slowly and gradually. In your work, there's no demarcation. Is this something you're aware of? Jaffe: The adventure of Morandi does not particularly interest me. It's infinitely repetitious, and I don't think I'm involved with that in the least. There have been different attitudes that informed certain groups of paintings, that helped me move, but they're not detectable. They're underneath the structure, maybe. I think they're visible, a little bit, to a very trained eye. I'm much more interested in what kind of structure I can involve the spectator in that's different and that forces them to perceive the world as it is. Jaffe: I want variety. I mean, I'm not interested in that "one thing" and deepening it. I find that boring. I would be bored. Jaffe: That's because I've been painting for a long time and perhaps my invention is thinning out. It's possible. There are some paintings that have had more adventurous forms than those that I do now, but now I'm in New York and I'm beginning to have new ideas. What inspires me are things that I see in the streets, like looking up and seeing these immense skyscrapers. These visions force me to think: What else can I do next? 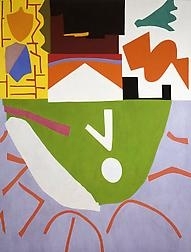 Rail: There are several recent paintings titled "New York Collage." Jaffe: Yes. That came because of the last trip I made here. I began to think that New York was filled with collage, that it wasn't a flat, beautiful, even surface that I often see in Paris. Everything here is a collage. It's all mixed up. Rail: Your work actually has a beautiful, even surface. At the same time, it's about disjunction. You could see the surface, control, and refinement of the paintings as more responsive to the landscape of Paris, and the overall clashing of shapes and colors and forms as something that belongs to New York. Jaffe: Well, I'm fighting constantly, in Paris, against the evenness. I work there, I'm fed by what I see. But, at the same time, I'm fed more intensely by that collage of New York. Jaffe: The physicality of it. I don't want to paste and cut. And I like to paint. I like the feeling of the brush. I like the stroke. Jaffe: Yes. You could do that with paper, but I wouldn't want to do it. Jaffe: Yes, I still do. An artist suggested cellophane to me as a way of saving the time of scraping down, and since then I've used it. But ultimately, I have to do it on the canvas even though it means trying out many potential solutions. When I hit on something I think is interesting, I try it on the canvas anyhow, without the cellophane, and then scrape. Rail: I was wondering about the relationship between the gouaches and the paintings. You've said that for a long time you thought that your gouaches were more successful than your paintings, but that more recently you feel that the paintings are doing what you wanted the gouaches to do. Jaffe: It first happened as an accident, a way of introducing another surface without meticulously painting another kind of surface. It's practically mechanical, but it was interesting to me because it broke up that sameness that was developing in my paintings. And I liked the fact that I could introduce something else as a material surface.